My niece brought home a letter from her preschool about a little girl, Maryn Cella, that attends the same school. She was diagnosed with brain cancer, and wasn't given very much time left. Her last wish was to go to Disneyland. Because the doctors said there wasn't much time, the mom put the entire trip on her credit cards and other means of credit. She passed away last Tuesday, shortly after returning from Disneyland. You can read more about Maryn HERE. They also have a donation button set up if you would rather donate there. As a parent, this breaks my heart. I cannot even imagine what this family is going through. To read the letter from the preschool, CLICK HERE. To read the letter about her trip to Disneyland, and with her funeral and viewing information, CLICK HERE. 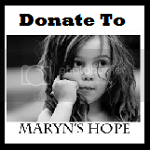 Go to Maryn's Hope website for more information on Maryn, and more donating information. Read Maryn's Mom's Blog to read what they have been going through the last few years. The preschool is collecting money for the girl's family, and my sister wants to help out in any way that she can. If you are interested in donating (even if it's $1.....you would be surprised how far $1 can go if everybody gives just that! ), please email me at michelle@enjoyutah.org and I will have my sister or I get a hold of you to collect whatever you want to help out with. We will make sure the money gets to the preschool to give to the family. We will be taking donations until Monday February 7th at 11:59pm. After that, you can continue to donate to her family on the Maryn's Hope website. Donate by using the button below. It will guide you to their official website. They have a paypal account set up to help pay for the trip the family took to Disneyland, medical bills, and funeral expenses. When you click on Donate, scroll down to where it has donating information. You can also make cash donations at any Chase Bank or Mountain America Credit Union. Checks need to be made out to "Maryn's Hope". Use the code below to paste this button on your own site to spread the word! Thanks for the link to the fundraiser you are doing! I will post it in the body of the post. Thanks!